I like to do Christmas knitting. A fair bit of it actually. And last year I didn't mail my box of gift knits to Ontario until well after Christmas (I blame 6 month old twins, moving twice in December for Kev's work, once to a house with no dishwasher, and Kev working literally around the clock in the ICU). This year, however, I am determined to be on time for Christmas, and so I started well in advance. 1 shawl. 1 pair of socks, 1 cowl, 3 hats, and 4 pairs of mitts. 1 baby, two toddler, 1 child, and 1 adult sweaters. Oh and the rest of my thesis to finish before Christmas. Clearly some of the things on that list are going to have to go. But it's still December, and I am still optimistic (ridiculously so) and ambitious (overly). But I am spurred on by the fact that some of those items are already underway, and others will be knit with bulky weight yarn (which practically knits itself). Yesterday I cast on that child's sweater. I swatched for it way back when. It's the Little Boxy by Joji Locatelli (pattern page, project page), and it's stockinette knit flat. 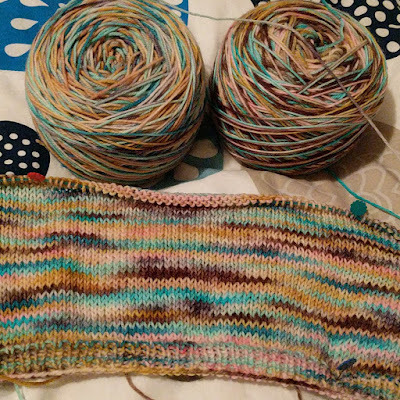 Borring knitting, so I have set myself a 4 inches a day goal, to force my way through this project. So here's hoping this sweater manifests itself quickly.